WHY: To support the rotary community and just to hang out and chill with good food, cool people and great RidEs! ATTRACTIONS: Raffle, Door Prizes, T-Shirts, Stickers, Food, and Relaxation. (This is a potluck event for all; please bring contributions for everyone: food, drinks, etc) ALCOHOL IS NOT PERMITTED ON SITE! POTLUCK: Please let us know what you will bring commenting on the potluck by sending us an email at SoCalAllRotary@gmail.com. Your generosity is greatly appreciated! Thank you to all of our Sponsors and Supporters of the Rotary Community! Big shout out to Black Halo Racing (BHR) for being a strong supporter of SCAR, the Rotary Community and sponsor of the upcoming SCAR RE-vival BBQ/Potluck Meet on 29 July 2017. Save your coins for the raffle because you might just come up! Donâ€™t forget to show some love and visit them online for your rotary performance parts at www.Black-Halo-Racing.myshopify.com. If attention to detail is your goal when modifying your RidE then DecalSpec should be at the top of your list. Their full service design and print studio can make your rotary design dreams come true! Stop by their shop or go online (https://decal-spec.com) and show some love. Thank you, DecalSpec for supporting the Rotary Community. BRAP ON!!! If you need a Rotary Shop that will give your RidE that TLC and attention to detail, then look no further because our friends at DNA Garage can help! Their full service rotary shop and skilled rotary technicians will make your rotary dREams come true! They will be in full force at the SCAR RE-vival BBQ/Potluck Meet on 29 July 2017, so stop by their shop and show some love. Thank you, DNA Garage for supporting SCAR, the Rotary Community and this yearâ€™s RE-Vival BBQ/Potluck Meet! BRAP ON!!! There are many options for oils for Rotary Engines, but none have proven it better than Idemitsu in the 24 Hours of Le Mans! Feed your Rotary Engine with oils and premix with a proven track record! Thank you Idemitsu for supporting SCAR, the rotary community, and helping to keep our Rotary Engines lubed to perfection! BRAP ON!!! Our brothers and sisters of #LasVegasAllRotary have donated some #LVAR swag that we will be raffling at the SCAR RE-vival BBQ/Potluck Meet on 29 July 2017. Thank you #LVAR for supporting SCAR, the Rotary Community and donating to our raffle! Donâ€™t forget to show some love at their monthly meets in Las Vegas and their next RotorCon in 2018! BRAP ON!!! We wouldnâ€™t be here without our friends at #Mazda keeping the Rotary Spirit Alive! Because #DrivingMatters they have graciously sponsored this yearâ€™s SCAR RE-vival BBQ/Potluck Meet on 29 July 2017. Thank you Mazda for supporting SCAR, the rotary community, and helping fellow Rotary Enthusiast Live the Rotary Life! BRAP ON!!! If you want a show REady look or a road REady solution in keeping your RidE looking clean and mean, then Mothers Polish-Waxes-Cleaners has the product for you! Mothers is an avid supporter of the rotary community and has sponsored this yearâ€™s SCAR RE-vival BBQ/Potluck Meet on 29 July 2017. Thank you Mothers for supporting SCAR, the rotary community, and helping to keep our Rotary RidEs looking REnowned! BRAP ON!!! Big shout out to our friends at PurelyRX8 for being a strong supporter of SCAR, the Rotary Community and a sponsor of the upcoming SCAR RE-vival BBQ/Potluck Meet on 29 July 2017. If you havenâ€™t visited their site see the links below, stay informed, and Stay Pure! Support those who support the rotary community. BRAP ON!!! Big shout out to Rotary13b1.com, they have been a long term supporter of SCAR, the Rotary Community and a continued sponsor of the upcoming SCAR RE-vival BBQ/Potluck Meet on 29 July 2017. Donâ€™t forget to show some love and visit Rotary13b1.com at online for all your rotary engine accessories. BRAP ON!!! Brap, Brap, Brap, give me oil darn it Brap! Donâ€™t be that guy or gal and forget to lube your beloved dorito machine! Thanks to our friends at Rotary Bum they have the lube you need at a stellar price! Donâ€™t thank us; thank Rotary Bum for keeping the Rotary Community well lubed! Thank you, Rotary Bum for supporting SCAR, the Rotary Community and donating to our raffle! Donâ€™t forget to show some love and visit them at their shop or online at www.RotaryBum.com. BRAP ON!!! One of the most important things to know about any Rotary Engine is itâ€™s compression. Rotary Compression Tester (RCT) has the must have product for any Rotary Enthusiast or Technician. They bring to you the newest digital Wankel Rotary engine specific compression tester. The name says it all! RCT, thank you for supporting SCAR, the Rotary Community and sponsoring the SCAR RE-vival BBQ/Potluck Meet on 29 July 2017. Donâ€™t forget to show some love and visit them online at www.RotaryCompressionTester.com. BRAP ON!!! Since the inception of SCAR, our friends at SoCal RX Club the driving force behind SevenStock, have been one of our strongest advocates. 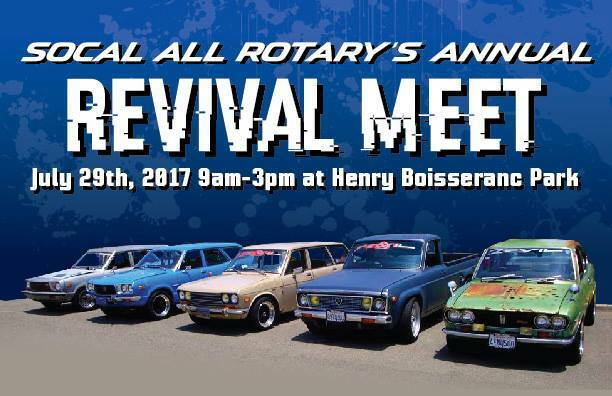 Socal RX Club, thank you for being a strong supporter of SCAR, the Rotary Community and sponsor of the upcoming SCAR RE-vival BBQ/Potluck Meet on 29 July 2017. Save your coins for some cool SevenStock swag we will raffle off. BRAP ON!! !